(MoneyWatch) Even for jaded connoisseurs of what is politely called the revolving door, Mary Schapiro's new job at Promontory Financial Group is a jaw-dropper. With her seat barely cold at the chairmanship of the Securities and Exchange Commission, Schapiro will become a managing director at a financial consulting and lobbying firm that has hired a slew of former financial regulators over the last several years and that represents for many a nexus of the cozy relations between banks and their regulators. The founder and CEO of Promontory is Eugene Ludwig, who headed the Office of the Comptroller of the Currency from 1993 to 1998. The OCC is one of the main banking watchdogs, and long seen as one of the most docile. 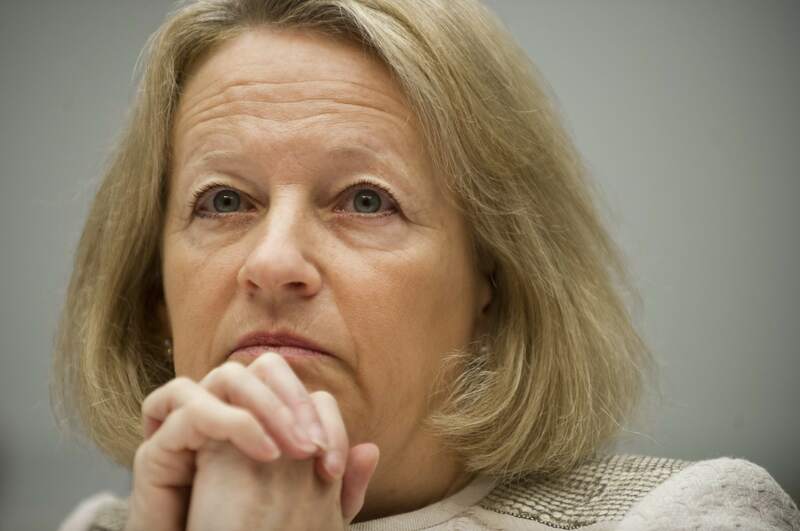 Schapiro told the Wall Street Journal on Tuesday that her new post at Promontory as head of the firm's governance and markets practice will not be spent lobbying. The former regulator dismissed the notion that her new job was indicative of the revolving door that connect the public and private sector because she doesn't plan to return to government services. Yet the services Promontory provides, like many such Washington creations, puts many former government officials in service to companies they once oversaw. "It's a regulatory fixer," said Bart Naylor, the financial policy advocate at Public Citizen. "The version they advertise is that they promote compliance beyond the letter of the law. But I don't know why banks would need to pay extra to find out what the speed limit is and be told to drive 20 miles slower." Despite their claims to the contrary, firms like Promontory effectively act as lobbyists, he added. "Mary Schapiro can't make calls to the SEC to do anything other than gain information," Naylor said. "But she can say to an associate who did not work at the SEC, 'You make the call.' They in turn can't say, 'Mary Schapiro wants you to do this.' But they can say, 'This is what we think you should do,' and the person getting the call would know exactly what it means." It's not clear how much Shapiro will be paid in her new job. A spokeswoman for Promontory did not return a call seeking comment. Promontory has received a double helping of bad publicity recently. In August, British bank Standard Chartered agreed to pay a $340 million fine to settle charges with New York State banking regulators that it laundered money for Iranian entities under sanction by the U.S. government. Before the settlement, the bank tried to minimize the damage by hiring Promontory, which found that there were only $14 million in illegal transactions. In the settlement, by contrast, the bank and regulators agreed that the illegal transactions were at least $250 billion. Earlier, Promontory was paid around $1 billion to help three banks sort out the number of illegal foreclosures they had committed during the so-called robo-signing scandal. Despite the enormous fees Promontory collected to review if foreclosures had broken the law, no homeowners received relief, the program was shuttered and the banks instead agreed to a federal settlement. Another recent Promontory hire was Julie Williams, the former chief counsel for the OCC, who resigned from the agency in August and joined the firm in January. While at the OCC, Williams had defended the hiring of Promontory and other consultants to comb through robo-signing cases and was also a prominent regulatory figure in the JPMorgan Chase (JPM) 'London Whale' trading debacle. When Williams resigned, Rep. Barney Frank, D-Mass., co-author of the bill that became the Dodd-Frank financial reform law, cheered her departure. "It's the best news financial reform has had in a while," he said at the time. In a more minor way, Schapiro raised eyebrows last month when she was offered a director's seat on the board of General Electric (GE) a mere three months after leaving the SEC. That part-time job pays at least $250,000 a year. Before taking the helm of the SEC, Schapiro was head of the Commodities Futures Trading Commission and the Financial Industry Regulatory Authority. Her tenure at SEC received lukewarm reviews from those who advocate financial reform and stricter accountability for banks. While President Obama signed Dodd-Frank into law in 2010, most of the rules are yet to be written, a job which falls heavily on the SEC. The agency has also drawn fire for consistently opting to settle charges of financial wrongdoing by big banks rather than taking executives to trial or referring their cases to the Justice Department for criminal prosecution. Jennifer Taub, an associate professor of law at Vermont Law School and expert in financial regulation, argued that the most insidious element of officials taking jobs such as Schapiro's is less the lobbying they do after they've left office than the work they do while they're inside government. "How are they protecting investors if they're thinking about a lucrative payday somewhere else?" she said. "At the staff level, if your plan is to work at an agency and land a lucrative job later, you may go light on research and recommendations, hoping that in a job interview you can point to that behavior. "It becomes much more significant at a commissioner level, where they vote on rulemaking." Taub said Schapiro's career contrasts markedly with those of two other people in powerful regulatory posts at the time: Elizabeth Warren, who led a government panel that investigated the financial bailout, and Sheila Bair, who headed the FDIC. The three were featured on the cover of Time Magazine in a May 2010 article that billed them as "The New Sheriffs of Wall Street." Now, as Schapiro heads off to Promontory, the sheriffs have all left office. Taub said that their new posts reflect how they approached their regulatory duties. Warren, who was an outspoken critic of Wall Street and of government officials such as former U.S. Treasury Secretary Timothy Geithner, is now in the U.S. Senate representing Massachusetts. Warren has continued her criticism of the financial industry and of what she clearly believes is lax regulation as a member of the powerful Senate Banking Committee. Bair, long seen as a thorn in the side of financial institutions and other regulators alike, is running a think tank at Pew Charitable Trusts dedicated to monitoring financial stability.